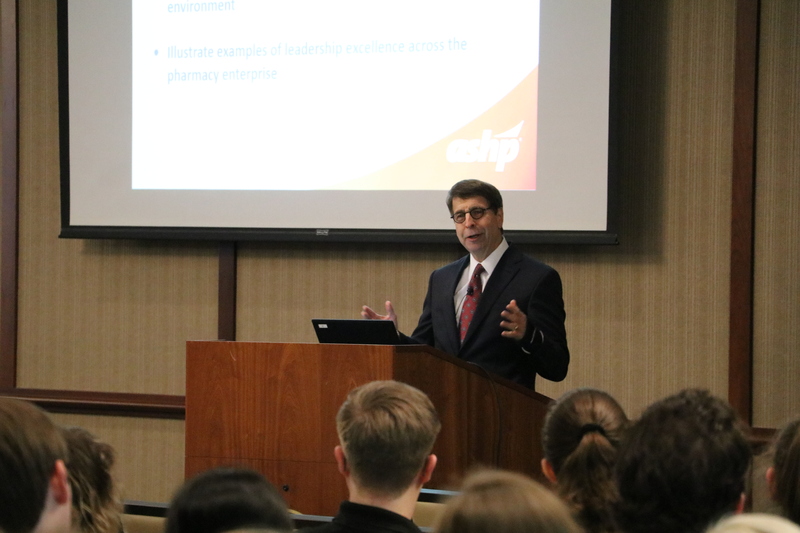 Samford University’s McWhorter School of Pharmacy welcomed Paul Abramowitz, chief executive officer of the American Society of Health-System Pharmacists (ASHP), April 3 to speak as part of the Dean’s Distinguished Lecture Series. Crouch created this lecture series in 2016 to bring national thought leaders to Samford’s campus to speak on contemporary topics related to pharmacy and the health care industry. In speaking to students, Abramowitz focused his lecture on leadership. “Great leaders discover, develop and celebrate what’s different about each individual…. The key is to recognize a person’s strengths, maximizing their talents and understanding their weaknesses,” he said. Abramowitz also challenged students to consider contemporary leadership perspectives, specifically the idea of disruptive innovation. “Medication therapy management is an example of disruptive innovation, which changed the role of a pharmacists from almost a purely dispensing role to the one we serve today, offering counseling and medication therapy,” Abramowitz said. Abramowitz spent 34 years working in hospitals and health systems before joining ASHP in 2011. Today, he lectures extensively on the effect that quality pharmacy care can have on improving outcomes of care and reducing costs, developing new care models, reducing adverse drug events and expanding comprehensive pharmacy care to the ambulatory setting.